There is no better classroom than the outdoors. GPNC offers field trips that spark curiosity and foster a sense of understanding. Rain or shine, we’ll still go outside. Students should be dressed appropriately. Exceptions are made for in the case of lightning or other dangerous weather. In which case, an alternative program will take place indoors. The sooner you schedule your field trip, the better. We cater to all groups, from PreK to college students and beyond. 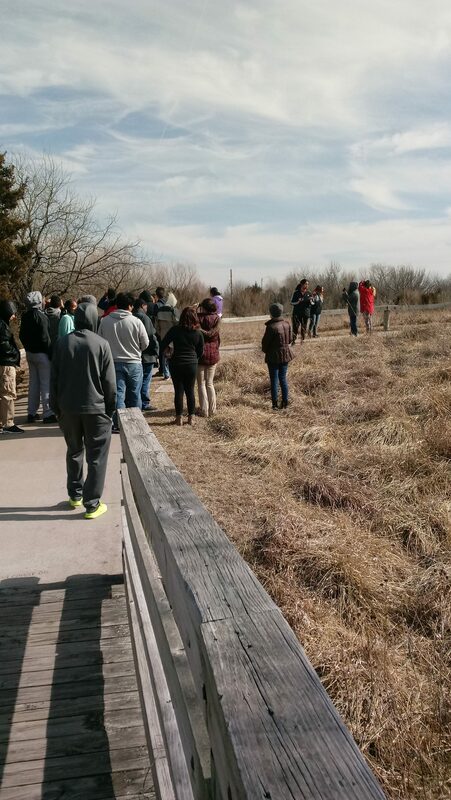 Example field trip topics: habitats, ecosystems, animals in winter, Kansas symbols, etc. Wear nametags so we can get to know you! For questions and more information or to schedule a field trip, please contact Lyndzee Rhine at lyndzee@gpnc.org. Phone calls are great, too; she can be reached at (316)-683-5499 ext 103. Extend your field trip with us to another Wichita educational institution. We reserve the right to turn away unscheduled groups if our building capacity is already full.